Cristina Morales is a London-based Spanish born Cultural Activist. With a BA in Social and Cultural Anthropology from the University of Barcelona and a MA in Arts and Culture Production from the Open University of Catalonia, she has become an artist, writer and cultural producer / curator linking art with politics. Keen on bridging art and society, she works for freelance projects and organisations using arts & culture as a tool to address topics such as identity, civil rights and community development. 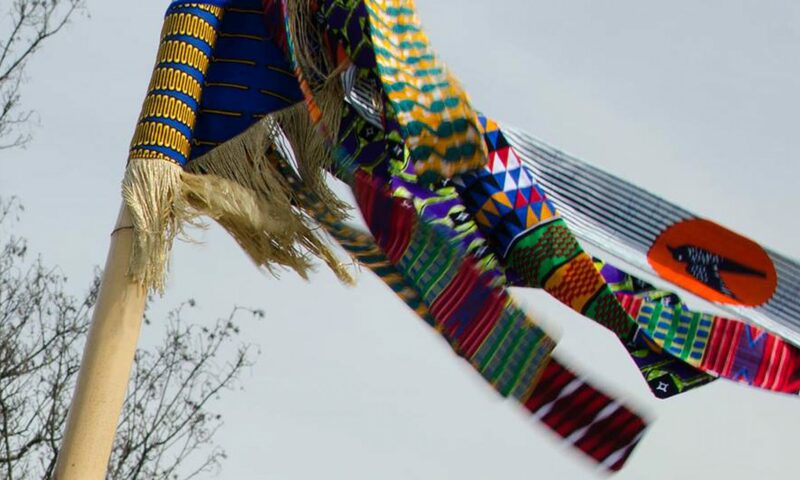 Examples of such projects and organisations include HostelArt, Ribermusica and Interarts in Barcelona or Black Cultural Archives, Peckham Platform, Mahogany Carnival Arts and Haringey Arts in London to mention a few. In addition to being the founding artist of the political fashion brand Totem Taboo, she also writes punctually for specialist media such as Voces, Wiriko and Radio Africa on contemporary African arts & culture, counter-culture and human development through art. Astro Black by Totem Taboo, Paris 2016. Totem Taboo | 2012 – Present in Barcelona , Paris & London. Totem Taboo is a political fashion and lifestyle brand building new collective imaginaries through the visual narrative of the symbol. Founding Director – Freelance Designer / Maker. Lookbooks Producer / Stylist / Art Director. Communication & Sales. * | First Spanish brand present in the most outstanding Contemporary Ethnic Art & Design shows in Europe like Labo International Paris 2012, Ethno Tendance Brussels 2012 , Afropunk Paris 2016 or Africa Utopia London 2017 to mention a few. * | Main stockist Quai Branly Museum‘s boutique in Paris. * | Part of the itinerant scenic fashion collective exhibition Parures organised by Universal Love exhibited to date at Klimafestivalen in Oslo, Norway 2018 and soon at The Manufacture Museum of Textile Memory and Creation in Roubaix, France. Mischief Makers at Brighton Pride featured in The Observer by The Guardian and BBC News, 2018. Mischief Makers Carnival Arts | 2016 – Present, London. Mischief Makers is led by freelance independent Carnival artist Emma Garofalo specialised in large scale kinetic costumes / puppetry & performance for community development projects all over United Kingdom. Freelance Costume Assistant | Costumes for Northampton Carnival -London, 2018. Performer | Brighton Pride Parade – Brighton, 2018. Costume Assistant | ‘Anima Mundi’ costume for Luton International Carnival , EMCCAN Caribbean Carnival Queen first prize winner – Luton, 2017. Workshops Facilitator | Kew Gardens – London, 2017. Costume Assistant & Performer | ‘Metamorphosis’ at Wandsworth Arts Fringe – London, 2017; Kew Gardens – London, 2017; Camp Bestival – Dorset, 2016. Mahogany Carnival Arts | 2016, London. Mahogany is a group of multi-disciplinary artists led by Clary Salandy and Speedy Ramdeen – trained originally with Peter Minshall – who design and create Carnival large scale kinetic sculptures using the human body in the art form of ‘Mas Making’, Masquerade or Street Theatre having been instrumental in introducing such art across the UK and also being a seminal force in educating European communities in the development of Carnival as a catalyst for bringing together people from culturally diverse backgrounds. Freelance Costume Assistant & Performer | ‘London is the place for me’ collection for the 50th Anniversary of Notting Hill Carnival winner of first prize – London. 2016. * | Mahogany’s costume got featured at page 29th of current British passport. Wiriko. First Spanish magazine specialised in Contemporary African Arts & Culture. Publications | Beth Lesser: From Roots Reggae to Dancehall in Jamaica. – January, 2016. Publications | Staying Power: Afro-British community’s self-representation. – April, 2015. Publications | Afro Comb: 6.000 years of culture, politics and identity. – October, 2013. Radio Africa Magazine. Relevant Spanish cultural container dedicated to Contemporary African Arts & Culture. Publications | Bronx:Africa. The influence of African culture in Bronx. – February, 2016. Voces | El Mundo. Voices is a Spanish Foundation with a blog in the Spanish national press El Mundo advocating for Human Development using disruptive culture and critical thought for radical social change. Publications | Intercultural dialogues through art. – March 2014.